After the node object is rebuilt, all of the attributes are compared, and then the node is updated based on attribute precedence. At the end of every chef-client run, the node object that defines the current state of the node is uploaded to the Chef server so that it can be indexed for search. So how does the chef-client determine which value should be applied? Keep reading to learn more about how attributes work, including more about the types of attributes, where attributes are saved, and how the chef-client chooses which attribute to apply. At the beginning of a chef-client run, all attributes are reset. 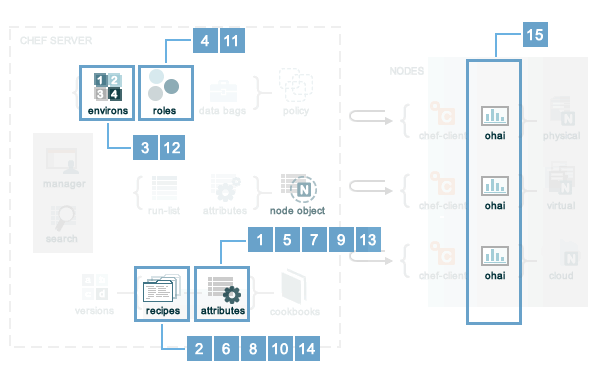 The chef-client rebuilds them using automatic attributes collected by Ohai at the beginning of the chef-client run and then using default and override attributes that are specified in cookbooks or by roles and environments. Normal attributes are never reset. All attributes are then merged and applied to the node according to attribute precedence. At the conclusion of the chef-client run, the attributes that were applied to the node are saved to the Chef server as part of the node object. default A default attribute is automatically reset at the start of every chef-client run and has the lowest attribute precedence. Use default attributes as often as possible in cookbooks. force_default Use the force_default attribute to ensure that an attribute defined in a cookbook (by an attribute file or by a recipe) takes precedence over a default attribute set by a role or an environment. normal A normal attribute is a setting that persists in the node object. A normal attribute has a higher attribute precedence than a default attribute. override An override attribute is automatically reset at the start of every chef-client run and has a higher attribute precedence than default, force_default, and normal attributes. An override attribute is most often specified in a recipe, but can be specified in an attribute file, for a role, and/or for an environment. A cookbook should be authored so that it uses override attributes only when required. force_override Use the force_override attribute to ensure that an attribute defined in a cookbook (by an attribute file or by a recipe) takes precedence over an override attribute set by a role or an environment. automatic An automatic attribute contains data that is identified by Ohai at the beginning of every chef-client run. An automatic attribute cannot be modified and always has the highest attribute precedence. node['platform'] The platform on which a node is running. This attribute helps determine which providers will be used. node['platform_version'] The version of the platform. This attribute helps determine which providers will be used. node['ipaddress'] The IP address for a node. If the node has a default route, this is the IPV4 address for the interface. If the node does not have a default route, the value for this attribute should be nil. The IP address for default route is the recommended default value. node['macaddress'] The MAC address for a node, determined by the same interface that detects the node['ipaddress']. node['fqdn'] The fully qualified domain name for a node. This is used as the name of a node unless otherwise set. node['hostname'] The host name for the node. node['domain'] The domain for the node. node['recipes'] A list of recipes associated with a node (and part of that node’s run-list). node['roles'] A list of roles associated with a node (and part of that node’s run-list). node['ohai_time'] The time at which Ohai was last run. This attribute is not commonly used in recipes, but it is saved to the Chef server and can be accessed using the knife status subcommand. The chef-client evaluates attributes in the order defined by the run-list, including any attributes that are in the run-list because of cookbook dependencies. In general, attribute precedence is set to enable cookbooks and roles to define attribute defaults, for normal attributes to define the values that should be specific for a node, and for override attributes to force a certain value, even when a node already has that value specified. One approach is to set attributes at the same precedence level by setting attributes in a cookbook’s attribute files, and then also setting the same default attributes (but with different values) using a role. The attributes set in the role will be deep merged on top of the attributes from the attribute file, and the attributes set by the role will take precedence over the attributes specified in the cookbook’s attribute files. This method was deprecated in Chef client 12.12 and will be removed in Chef 14. Please use default_unless or override_unless instead. Use the _unless variants carefully (and only when necessary) because when they are used, attributes applied to nodes may become out of sync with the values in the cookbooks as these cookbooks are updated. This approach can create situations where two otherwise identical nodes end up having slightly different configurations and can also be a challenge to debug. Attributes can be configured in cookbooks (attribute files and recipes), roles, and environments. In addition, Ohai collects attribute data about each node at the start of the chef-client run. See https://docs.chef.io/attributes.html for more information about how all of these attributes fit together. A useful method that is related to attributes is the attribute? method. This method will check for the existence of an attribute, so that processing can be done in an attributes file or recipe, but only if a specific attribute exists. An attribute can be defined in a role and then used to override the default settings on a node. When a role is applied during a chef-client run, these attributes are compared to the attributes that are already present on the node. When the role attributes take precedence over the default attributes, the chef-client will apply those new settings and values during the chef-client run on the node. A role attribute can only be set to be a default attribute or an override attribute. A role attribute cannot be set to be a normal attribute. Use the default_attribute and override_attribute methods in the Ruby DSL file or the default_attributes and override_attributes hashes in a JSON data file. An attribute can be defined in an environment and then used to override the default settings on a node. 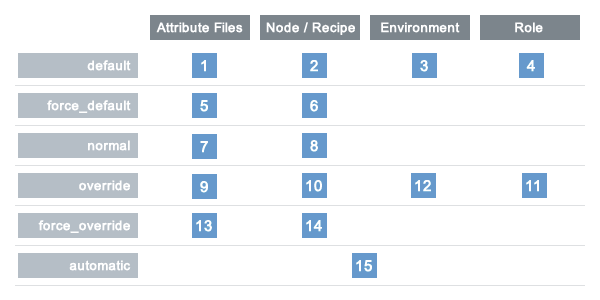 When an environment is applied during a chef-client run, these attributes are compared to the attributes that are already present on the node. When the environment attributes take precedence over the default attributes, the chef-client will apply those new settings and values during the chef-client run on the node. An environment attribute can only be set to be a default attribute or an override attribute. An environment attribute cannot be set to be a normal attribute. Use the default_attribute and override_attribute methods in the Ruby DSL file or the default_attributes and override_attributes hashes in a JSON data file. where the last attribute in the list is the one that is applied to the node. The attribute precedence order for roles and environments is reversed for default and override attributes. The precedence order for default attributes is environment, then role. The precedence order for override attributes is role, then environment. Applying environment override attributes after role override attributes allows the same role to be used across multiple environments, yet ensuring that values can be set that are specific to each environment (when required). For example, the role for an application server may exist in all environments, yet one environment may use a database server that is different from other environments. When these settings are used, any attribute not defined in a whitelist will not be saved. Each attribute type is whitelisted independently of the other attribute types. For example, if automatic_attribute_whitelist defines attributes to be saved, but normal_attribute_whitelist, default_attribute_whitelist, and override_attribute_whitelist are not defined, then all normal, default and override attributes are saved, along with only the specified automatic attributes. Attributes that should be saved by a node may be whitelisted in the client.rb file. The whitelist is a Hash of keys that specify each attribute to be saved. automatic_attribute_whitelist A Hash that whitelists automatic attributes, preventing non-whitelisted attributes from being saved. For example: ['network/interfaces/eth0']. Default value: all attributes are saved. If the Hash is empty, no attributes are saved. default_attribute_whitelist A Hash that whitelists default attributes, preventing non-whitelisted attributes from being saved. For example: ['filesystem/dev/disk0s2/size']. Default value: all attributes are saved. If the Hash is empty, no attributes are saved. normal_attribute_whitelist A Hash that whitelists normal attributes, preventing non-whitelisted attributes from being saved. For example: ['filesystem/dev/disk0s2/size']. Default value: all attributes are saved. If the Hash is empty, no attributes are saved. override_attribute_whitelist A Hash that whitelists override attributes, preventing non-whitelisted attributes from being saved. For example: ['map - autohome/size']. Default value: all attributes are saved. If the Hash is empty, no attributes are saved. It is recommended that only automatic_attribute_whitelist be used to whitelist attributes. This is primarily because automatic attributes generate the most data, but also that normal, default, and override attributes are typically much more important attributes and are more likely to cause issues if they are whitelisted incorrectly. When a whitelist is defined, any attribute of that type that is not specified in that attribute whitelist will not be saved. So based on the previous whitelist for normal attributes, the filesystem and map - autohome attributes will not be saved, but the network attributes will. The following examples are listed from low to high precedence. normal['apache']['dir'] = '/etc/apache2'  #set is an alias of normal. default! ['attribute'] = "The '!' means I win!" override! ['attribute'] = "The '!' means I win!" A specific attribute precedence level for default, normal, and override attributes may be removed by using one of the following syntax patterns. These patterns return the computed value of the key being deleted for the specified precedence level. The following examples show how to remove a specific, named attribute precedence level. Using node['foo'].delete('bar') will throw an exception that points to the new API. The following examples show how to remove all attribute precedence levels. Attributes are typically defined in cookbooks, recipes, roles, and environments. These attributes are rolled-up to the node level during a chef-client run. A recipe can store attribute values using a multi-level Hash or array. But that is not very efficient, especially because most of them are identical. 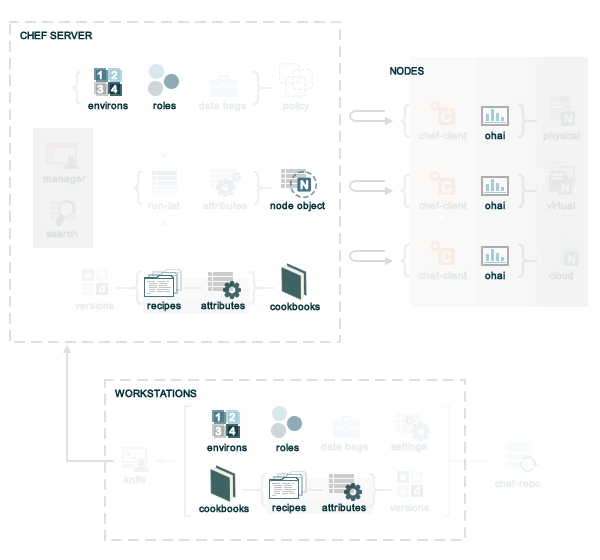 The deep merge capabilities of the chef-client allows attributes to be layered across cookbooks, recipes, roles, and environments. This allows an attribute to be reused across nodes, making use of default attributes set at the cookbook level, but also providing a way for certain attributes (with a higher attribute precedence) to be applied only when they are supposed to be. description "The most basic role for all configurations"
Both of these files are similar. They share the same structure. When an attribute is of the same type of data, such as a hash or an array, that data is merged when the attribute precedence levels are the same and is replaced when the attribute precedence levels are different. For example, the web.rb references the baseline.rb role. The web.rb file only provides a value for one attribute: :startservers. When the chef-client compares these attributes, the deep merge feature will ensure that :startservers (and its value of 30) will be applied to any node for which the web.rb attribute structure should be applied. Even though the web.rb file does not contain attributes and values for minspareservers, maxspareservers, serverlimit, maxclients, and maxrequestsperchild, the deep merge capabilities pulled them in. The following sections show how the logic works for using deep merge to perform substitutions and additions of attributes. When items cannot be merged through substitution, the original data is overwritten.